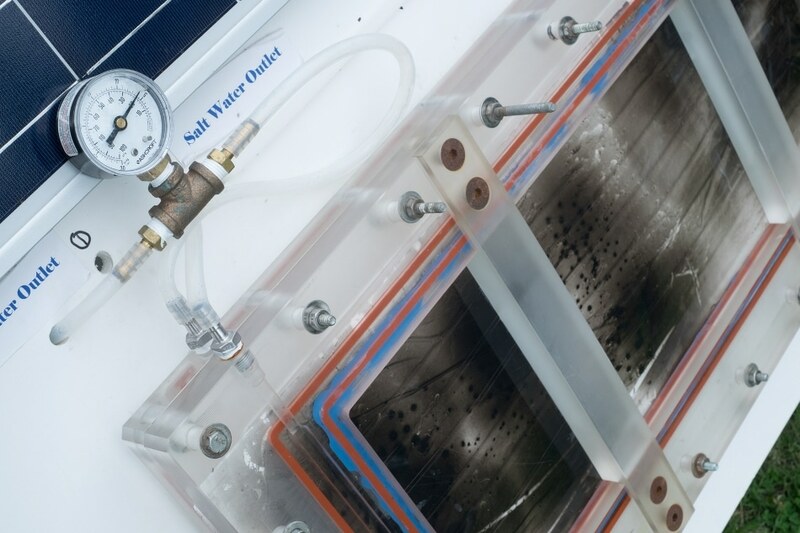 NEWT’s “nanophotonics-enabled solar membrane distillation” technology (NESMD) integrates tried-and-true water treatment methods with cutting-edge nanotechnology capable of transforming sunlight to heat. The recent online issue of Proceedings of the National Academy of Sciences presents a description of this technology. Over 18,000 desalination plants function in 150 countries, however NEWT’s desalination technology is unlike any other that is currently being used. Direct solar desalination could be a game changer for some of the estimated 1 billion people who lack access to clean drinking water. This off-grid technology is capable of providing sufficient clean water for family use in a compact footprint, and it can be scaled up to provide water for larger communities. Distillation is considered to be the oldest method that has been used for producing freshwater from salt water. In this method, salt water is boiled and the steam is captured and made to run through a condensing coil. This distillation method has been used for centuries, however it needs complex infrastructure and is considered to be energy inefficient because of the amount of heat needed for boiling water and producing steam. More than half the cost of running a water distillation plant is used for energy. An emerging technology for desalination is membrane distillation. In this method, hot salt water is made to flow across one side of a porous membrane and cold freshwater is made to flow across the other. Water vapor is naturally drawn through the membrane from the hot to the cold side, and the energy requirements are less than they would be for standard distillation since the seawater need not be boiled. However, the energy costs are still important since heat is constantly lost from the membrane’s hot side to the cold side. Unlike traditional membrane distillation, NESMD benefits from increasing efficiency with scale. It requires minimal pumping energy for optimal distillate conversion, and there are a number of ways we can further optimize the technology to make it more productive and efficient. The new technology developed by NEWT builds upon research performed in Halas’ lab in order to produce engineered nanoparticles capable of harvesting as much as 80% of sunlight to generate steam. NEWT added commercially available, low-cost nanoparticles to a porous membrane in order to significantly change the membrane itself into a one-sided heating element that is capable of heating the water all by itself in order to drive membrane distillation. “The integration of photothermal heating capabilities within a water purification membrane for direct, solar-driven desalination opens new opportunities in water purification,” said Yale University's Menachem “Meny” Elimelech, a Co-Author of the new study and NEWT’s Lead Researcher for membrane processes. In the PNAS study, Researchers provided proof-of-concept results based on the tests conducted with an NESMD chamber just a few millimeters thick and about the size of three postage stamps. A custom designed top layer of carbon black nanoparticles infused into a porous polymer was present in the distillation membrane in the chamber. The light-capturing nanoparticles heated the complete surface of the membrane when exposed to sunlight. A cool freshwater stream flowed below, and a thin half-millimeter-thick layer of salt water flowed on the top of the carbon-black layer. Li said NEWT’s research team has earlier developed a much bigger system comprising of a panel that is about 70 cm by 25 cm. She stated that NEWT ultimately hopes to develop a modular system where users will be able to order as many panels as they require based on their daily water requirements. You could assemble these together, just as you would the panels in a solar farm. Depending on the water production rate you need, you could calculate how much membrane area you would need. For example, if you need 20 liters per hour, and the panels produce 6 liters per hour per square meter, you would order a little over 3 square meters of panels. NEWT, established by the National Science Foundation in 2015, focuses on developing mobile, compact, off-grid water-treatment systems capable of providing clean water to millions of people who do not have it and making U.S. energy production more cost-effective and sustainable. Over the next decade, NEWT is expected to leverage over $40 million in industrial and federal support and is considered to be the first NSF Engineering Research Center (ERC) in Houston and just the third in Texas since the ERC program was started by NSF in 1985. NEWT concentrates on applications for rural water systems, humanitarian emergency response and wastewater treatment and reuse at remote locations, including both offshore and onshore drilling platforms for gas and oil exploration.